How do I transition to Continuous Performance Management? There's been a steady move away from the more traditional, annual performance appraisal towards an agile, on-going and continuous performance management approach. Organisations large and small are taking the decision to rethink how their managers and team members check-in and update goals, objectives and progress. They are looking to create more flexible, employee-centred practices which focus on helping people perform at their best – rather than filling in endless forms. 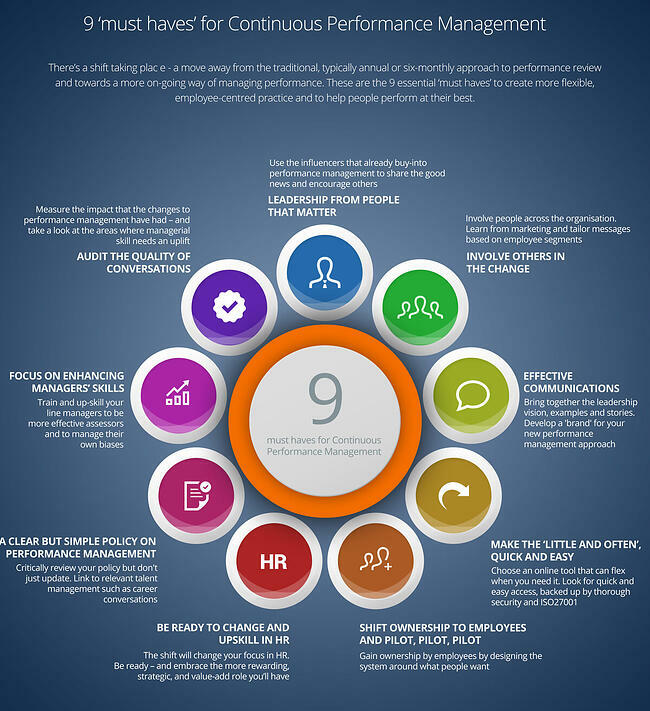 A survey conducted by Mercer in 2013 showed that: 95% of organisations set individual end of year performance rating. Those figures are likely to be reducing, but the reality is that most companies have – and will need to continue to have – some form of performance review process. But take a step back. What have been the problems of the annual performance review that have prompted this move? 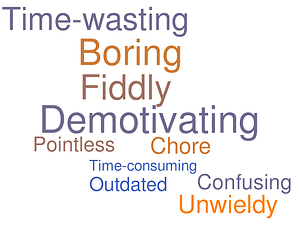 One of these is likely to be one of time and the perceived value gained. If you asked your managers and individuals who have to engage in a year-end assessment, what would they say? If you're looking to get started with Continuous Performance Management, then let's get back to basics. There are a number of questions we hear regularly. Question #1 - Why does performance appraisal fail? There are a number of reasons why performance review may not have the impetus behind it to be a valuable part of the talent management strategy. As a very basic level, perhaps we've all forgotten why we're doing it - and managers simply just don't see the value in the time spent. For some organisations, their performance review approach tries to do too much; different stakeholders want different things, and we try to shoehorn pay review, career conversation and business update into a single event. It just doesn't work. For some, performance management software isn't used. Spreadsheets and text documents are used, submitted and then rarely looked at again until the interim review - or annual review. Question #2 - What is Continuous Performance Management? Question #3: What are the foundations for Continuous Performance Management? If you're looking to explore how to get started with - and embed - a more flexible approach to performance review, then take a look at the 9 must haves we know are essential. Question #4: Is Continuous Performance Management right for your organisation? Whilst there may be plenty of talk about Continuous Performance Management, the question remains is it right for your organisation? Is it worth the upheaval? And what are the signals or flags to know if this is the right call for your company? For us, there are three key indicators or markers that show that your organisation is ready for a more agile approach to performance review. How does performance appraisal work now in your organisation? How digitally ready are you? What conversations are taking place right now? If you're thinking about performance management for small companies, then you may want to find out more how to engage your employees. Question #5: How do we make sure Continuous Performance Management gets embedded? There are, in our experiences, 10 features of a robust continuous management approach. View it as a change programme with all the buy-in, communication, plan and support that such a programme requires. Commit to train managers to be coaches of performance. Decide on an online performance feedback software system. Make sure that check-in meetings are scheduled, held, recorded and acted upon. Information can be accessed in real time. Performance objectives are linked directly to the business goals. The senior team can access the data and analyse it themselves, not needing someone in HR to collate spreadsheet data once a year. The organisation can see that continuous performance management is working. You can read more in our eBook - about getting started. Question #6: how can HR help line managers to get better at performance review? Effective performance review is more than getting your managers and their team members together more often. The time spent should be 'quality time' at which goals are discussed, coaching to overcome hurdles provided and plans put into place. Managers need to understand how to set objectives and how to have better and more engaging performance conversations. They'll need support from HR to up-skill - and to have access to appraisal tools that fit with the organisation, that are easy-to-use, simple to update and straightforward to implement. Cascading objectives help to ensure that all individuals are aligned with organisational and departmental goals. Your appraisal software should be able to take care of this. Feedback from others on an individual's performance not only engages the wider team, but recognises achievement and generates more opportunities for learning. Again this requires a cloud-based performance review system that enables managers and employees to request and record feedback from others. Learn more about how to make performance reviews more effective. Question #7#: How do 'millennials' want to be performance managed? Gen Y, Gen Z and the talent consumer reportedly have a different approach to the world of work. This will impact across your talent management strategy - and your performance review process. Question 8: How will we know that our new approach is working? After the roll-out and implementation, you'll want to know that your new appraisal and more regular check-ins are up and running - and taking place. Some appraisal software helps give you, as the HR decision maker, a line of sight as to what is happening. Our Continuous Performance Management Index score is a great example of this. Question #9 What do others do? Find out how others are implementing continuous performance management. Network and learn from others. 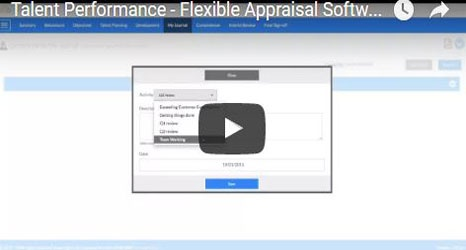 Read case studies and makes sure you speak with vendors of performance appraisal software. Check out the key questions to ask. It you want to take a look at how a cloud-based performance management tool can work, watch the short video below. Or read about more about Talent Performance when you're ready to see for yourself how it could work for you, get it touch.